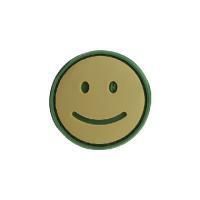 Spread good cheer everywhere the road takes you with this brightly colored Happy Face Morale Patch from Maxpedition. Its hook-backing attaches to any loop field, including the ones found on most Maxpedition bags, making it easy to customize apparel and gear. The patch also includes its own loop sheet that can be sewn onto clothing or equipment, or serve as a protective covering when not in use. The circular patch is made from durable PVC rubber, guaranteeing lasting durability. As a bonus, the choice of rubber material makes the patch simple to clean with regular soap and water.